27 November 2015 , D-DAY for Christmas season shoppers. Black Friday, the busiest shopping day of the year is making its entrance in Tanzania. The event, blown over from the US and the UK, is famous for its outrageous deals and discounts. In 2014, 133.7 million US citizens were shopping on Black Friday, spending $380 on average per person. Black Friday, the 4th Friday of November, the day after Thanksgiving, is the official start of the Christmas Shopping-Season. Its name stems from 1961, when the day after Thanksgiving was known for enormous traffic jams in the US. All this traffic was causing an enormous output of exhaust fumes, hence the term ‘Black Friday’. Later, the day became well-known for the enormous shopping frenzies. Stores now open at Midnight and offer the best deals and discounts, with limited supply. This causes shoppers to stand in line for many hours and go berserk when the stores open. Occurrences of people hurling themselves on the best deals, without hesitation to use violence if necessary, are not uncommon during Black Friday sales. This year, Black Friday makes an entrance in Tanzania. However, having learnt from the experiences in the US and the UK, some modifications have been made. 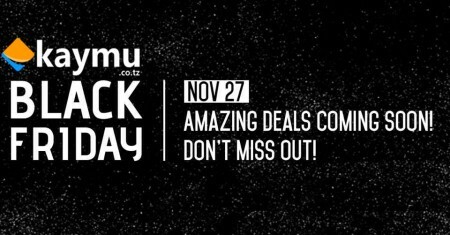 The Tanzanian Black Friday will be an online shopping event, hosted on the nation’s biggest marketplace: Kaymu.co.tz. On 27 November, the greatest deals and discounts will be made available for 24 hours and include a large variety of products. The idea behind an online Black Friday is for the community to benefit from the offers, but without standing in line, violent shoppers or traffic jams. On top of that purchases will be safely delivered to your home. Can Tanzania set an example for the rest of the world on Black Friday? We will find out on 27 November.